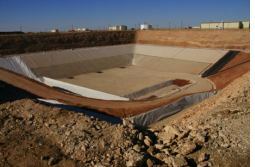 A low-level radioactive waste facility in Texas has started disposal operations, sealing away its first ever shipment of waste materials. The Texas Compact Facility in Andrews County is the only facility in the USA to be licensed within the last 30 years that is authorised to dispose of all classes of low-level radioactive waste (LLW) materials considered suitable for near-surface burial. It accepts waste from the nuclear medicine, research, and power sectors and will help keep down the price of these vital technologies. Facility operator Waste Control Specialist, a subsidiary of Valhi, has treated and stored LLW at the site since 1998. However, the disposal which took place 27 April marked a new phase in the company's existence. According to WCS CEO William Lindquist, "We have finally completed what we set out to do almost 17 years ago, which is to provide the industry with a 'one-stop shop' for its hazardous, toxic and radioactive waste needs." He added, "I am pleased to announce that medical researchers and universities that use radioactive materials every day to save lives, and nuclear power plants that produce much of our country's energy needs, are now using a facility specifically designed, engineered and constructed to permanently dispose of the low-level radioactive waste that is currently in temporary storage, much of it in urban centres,"
All waste goes into steel reinforced concrete canisters 3 metres tall and 20 centimetres thick. These will be stacked in a landfill area 305 metres deep and braced with a concrete liner over two metres thick. This will eventually be covered over by concrete and the site returned to a greenfield status, with the waste stored safely within. The facility is situated in a semi-arid and isolated location and sits atop a 150 metre thick feet layer of impermeable red-bed clay not near to any underground drinking water sources. This clay formation, along with strong local support, makes the ideal setting for an LLW disposal facility. The Texas Compact Facility may be unique in that the impetus for its development came almost entirely from local leaders. These were looking to diversify income for Andrews County, which is traditionally sustained by an oil and gas based economy - subject to cycles of boom and bust. WCS has continued to engage with the local community throughout the long development process and enjoys strong support. The facility is licensed to operate for 15 years after which the owners, the State of Texas, may decide to seek an extension or decommission the facility.